Each state has their own set of regulations which determine the allowable level of gas concentration inside an area, where and how many monitors must be placed, and what happens when an alarm goes off. Medford, OR, which resides in Jackson County, outlines key requirements for cannabis manufacturing facilities in a format that is publicly available, which include a gas detection and exhaust & ventilation system which depends on the type of extraction process in use. Hydrocarbons, referred to in many government manuals as Liquified Petroleum Gas (LPG), require monitoring for volatile hydrocarbon gas levels, which at even minor concentrations can be both toxic and explosive. 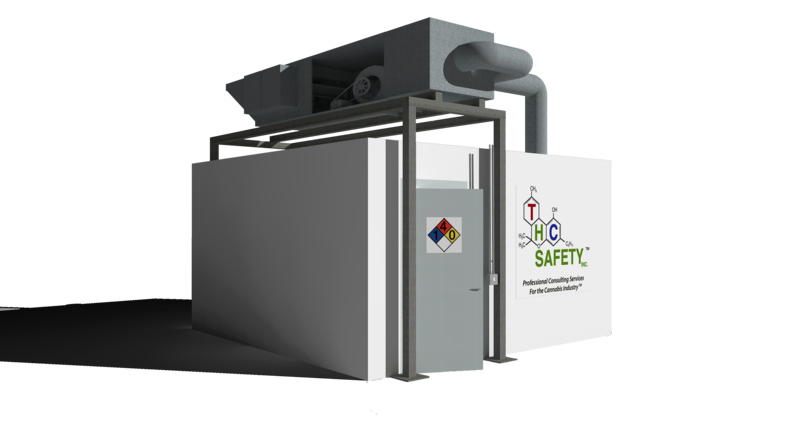 Supercritical CO2 of course is not flammable, but CO2 is an odorless asphyxiant that represents an imminent loss-of-life danger if a leak occurs. For LPS gas detection, a device called a Lower Explosive Limit (LEL) detector, a local alarm only which does not require off-site monitoring or the alerting of the entire facility when it goes off. The key requirement is that when gas concentrations reach the Permissible Exposure Limit (PEL), a sufficiently loud alarm exists that warns the occupants of that particular area. If a monitoring alarm is set off, a sufficiently powerful exhaust and ventilation system must be in place to evacuate the hazardous area. “There are many different ways to design a hazardous exhaust system,” the Jackson County manual says, “including fume hoods, walk-in hoods, booths, and exhausted rooms.” Complete extraction rooms that are C1D1 compliant are available for purchase and can be customized for whatever your needs happen to be. Monitoring an supercritical fluid extraction machine, as mentioned before, requires slightly different considerations, which place less emphasis on the gas evacuation and more on proper preventative ventilation and appropriate CO2 leak monitoring. However, the Colorado Fire Marshals’ Special Task Group on Cannabis Facility regulations has determined that CO2 monitoring is an absolute requirement in extraction facilities. This highlights the important differences that can be seen in safety regulations across state lines. Jackson County, OR. Building Code Guidelines for Commercial Marijuana Extraction and Grow Facilities. Part III – Specific Gas Detection. Oregon Structural Specialty Code (OSSC) 2014 104.1. Colorado Fire Marshals’ Special Task Group. Marijuana Facility Guidance v.1: “Gas Detection and Alarms”. Based on the 2015 International Fire Code. Effective Date: March 11, 2016. Image Citation: THC Safety, Inc.